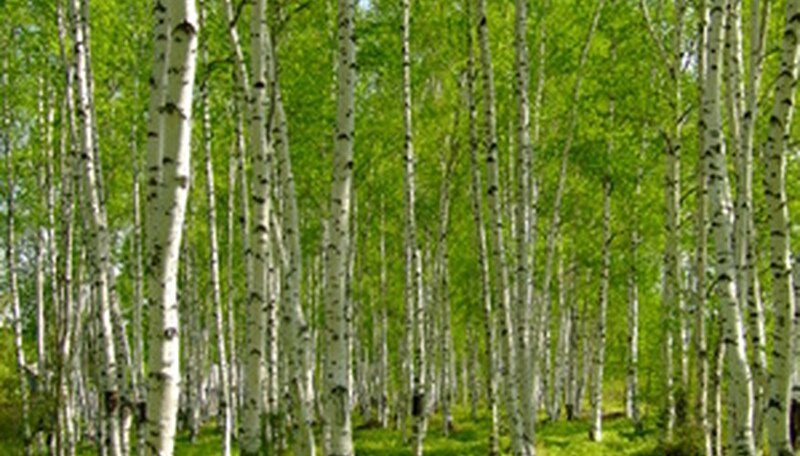 The papery, speckled white bark of the birch tree often makes it stand out as a landscaping feature but birch trees are susceptible to insects and breakage during storms. They often must be cut down. Fortunately, birch trees require no special care when it comes to cutting other than, to keep in mind the natural leaning of the tree or any particularly dense growth on one side of the tree or the other, which might affect its balance. Determine the tree's height by cutting a stick the same length as your arm. Hold the stick in front of you, vertically, at arm's length and step away from the tree until the stick covers your entire view of the tree. Measure the distance from where you are to the base of the tree--that is the tree's approximate height. Decide on a direction for the tree to fall, so that it will not land on electrical wires, buildings, fences or vehicles. For example, if the tree is leaning steeply to the north, it will be best if you can allow it to fall in that direction, if possible. Put on your gloves, eye protection and ear protection and start your chainsaw. No particular blade is necessary due to the softness of the birch wood. Run the chainsaw at moderate speed. Make a horizontal cut into the trunk of the tree on the side where you wish the tree to fall. Make this cut approximately 1/3 of the way through the tree. Make a second cut, a downward cut at approximately a 45 degree angle. Start this cut six to eight inches above your first cut, so that the downward cut will intersect your horizontal cut approximately 1/3 of the way through the tree. Remove the wedge of wood which the two cuts have created, leaving a notch in the side of the trunk. This notch should be aimed in the direction you wish the tree to fall. Make a third cut, on the opposite side of the tree, a horizontal cut straight into the trunk of the tree approximately two inches higher than the horizontal cut on the other side of the tree. Before this cut reaches the notch you made in the tree, the tree will slowly and gracefully begin to fall in the direction of the notch you made. Shut off the chainsaw and step out of the way as the tree falls. Make a horizontal cut at ground level to remove the bulk of the stump. If it is desired, remove all of the stump. A stump grinder can be rented and the stump ground out completely. Rake up any chips of wood and dispose of them. Plan more than one escape route in case the tree does not fall exactly as planned. Once the tree begins to fall run away from the tree at approximately a 45 degree angle away from the angle of fall. Keep the blade on your chainsaw sharp at all times for quicker and easier cutting. Follow all manufacturer's instructions regarding the running of the chainsaw. Never try to stop a tree from falling once it begins to fall.